Should You Meditate or Exercise First? Exercise and meditation both help to promote health on all levels, including your physical, psychological and emotional well-being. Regular moderate activity helps you to maintain overall vitality, manage your weight and keep your stress levels low. Meditation techniques improve focus and lowers stress. Both disciplines are important in whatever order your schedule permits. But spending a short time to meditate before exercising might enhance your performance. While meditating before or after your workout depends entirely on your schedule, you might think about using your warmup to focus on what you hope to achieve. Slow your breathing, focus on the muscles you'll be using and gently set an intent. A proper combination of exercise and healthy nutrition helps to increase fat loss, muscle strength and energy. A body functioning at peak efficiency contributes to soaring energy levels, so you may feel energized and happy even hours after you have exercised. This is primarily due to the release of endorphins, opioids in the pituitary glands that block pain, decrease appetite, promote feelings of euphoria, and reduce tension and anxiety. According to Lift for Life, the level of endorphins in your blood can increase up to five times that of resting levels during 30 minutes or more of aerobic exercise. Over time, you become more sensitive to these endorphins, so when they are produced, they stay in your blood for a longer period of time. While exercise tends to promote energy through the release of endorphins, regular meditation is typically practiced to promote relaxation. Project-Meditation suggests that the area of the brain that feels the greatest effects of meditation is associated with happiness. In addition, meditation helps relax your mind and body, release built-up stress and promote feelings of peace and well-being. 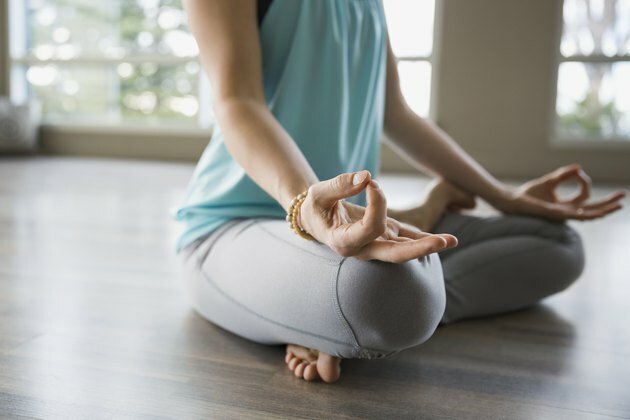 Rather than exhaust the body through aerobic activity, meditation utilizes focused breathing and mind exercises that are aimed at reducing heart rate, respiration and other signs of stress. Rigorous physical activity will trigger the release of endorphins, whereas meditation will reduce cortisol, a chemical related to stress and overeating. It is apparent that exercise in the form of aerobic activity, including walking, running, swimming, dancing and hiking, can promote health and well-being similar to that of mindful meditation. Both allow you to release stress and engage in health-promoting activities. However, the main difference between the two is that aerobic exercise is energizing and active, while mediation is calming and practiced to promote relaxation. According to ACE Fitness, most exercise enthusiasts stretch prior to their workouts, and performing those stretches mindfully can improve your focus much like a seated meditation. While focusing on breathing and the target muscle, stretching and relaxing these muscles prior to a workout will give your body and mind the guided and focused energy needed to exercise properly. Practicing a simple meditation before you begin your exercise is a beneficial way to stretch your muscles with focus and control. It is natural for your mind to drift while you are meditating but, through practice, you can guide it back to your intention of the moment. Try filling up with focused energy prior to your workout by flexing the target muscle during the inhale and relaxing it during the exhale. This simple pre-workout meditation can be done in your car before entering the gym, or inside before you start your routine. Begin by sitting up straight, taking deep abdominal breaths, slowly exhaling, closing your eyes and concentrating on the muscles you are planning to exercise. Continue for five minutes, and focus on your breathing and the target muscle while stretching and relaxing.